The SDK Mini EMF Printer Driver is designed for software developers to realize the function of printing any printable documents to image formats when developing their own software. The users can call the internal virtual printer, command line, functions and codes in the SDK to make their applications more powerful. The virtual printer VeryPDF Demo EMF Printer can print the printable documents to EMF image format. So if you want to pptx to emf, you can use it. You need to download Mini EMF Printer Driver for using the virtual printer VeryPDF Demo EMF Printer smoothly. Please click here to download the trial version of the SDK and install it on your computer. You can choose whether to set VeryPDF Demo EMF Printer as the default printer of your computer. Of course, if you convert documents to EMF format image often, you’d better make VeryPDF Demo EMF Printer as the default one. Please see the the process about printing pptx to emf in the following contents and you just need to print the PPTX document to VeryPDF Demo EMF Printer, which is enough. Please open the PPTX document and click “File”—“Print” to open “Print” dialog box. In “Printer” dropdown list, you can choose “ VeryPDF Demo EMF Printer ” as current printer and click “Print” button to run the conversion from pptx to emf. Please see the process in Figure 1. You can also use the hot key “Ctrl”+ “P” to open “Print” dialog box. 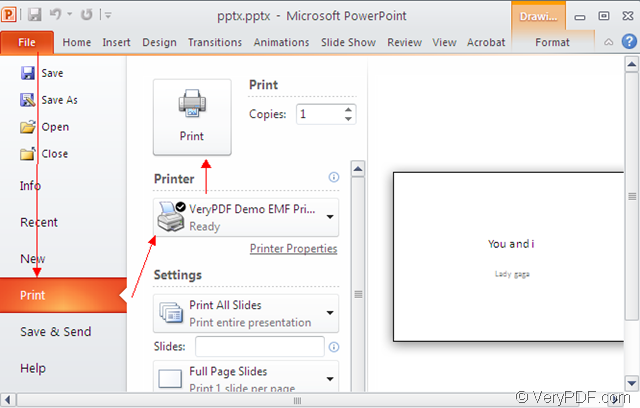 If you have set VeryPDF Demo EMF Printer as the default printer, you don’t need to open the PPTX document. You should right click it and choose “Print” option to directly run the conversion. When the conversion from pptx to emf is over, you can see your target file appear on the screen. If you want to find it, you need to open the default location—C:\. Maybe someone need to change the current location to another one. Please open the file in installation location by clicking the path “C:\Program Files\VeryPDF Mini EMF Printer v2.0\emf_printer_driver\option.ini”. Then please find the command “OutputFile=C:\” in the file and change “C:\” as the one you need manually. Next time the target file will be saved in the new location. If you need the developer license of Mini EMF Printer Driver, please buy it via clicking the following link: http://www.verypdf.com/order_miniemfprinter.html. Then you will be able to develop or distribute your own applications based on the SDK for free. You are also free to redistribute the components about the SDK to your applications in the future. This entry was posted in Mini EMF Printer Driver and tagged pptx to emf. Bookmark the permalink.